In the forward to Jay Riedel’s new book “Memories of a Fighter Pilot,” General Charles “Chuck” Horner, USAF (ret.) writes, “No fighter pilot is ordinary, but Jay’s story is extraordinary. “ Extraordinary? With all due respect to the good general, I would say that Riedel’s story goes beyond extraordinary, by a large measure. Consider this. Most USAF pilots spent at least one year flying combat in Southeast Asia during the Vietnam War, and many returned for a second tour. But relatively few flew three tours there. Riedel was one of those who did, and did so in three types of aircraft: the KC-135 refueling aircraft, plus the F-100 and A-7, air to ground fighter aircraft. As for being in harm’s way, it becomes evident when reading the accounts of his three tours, his flying routinely placed him deep into heavily defended areas in both North and South Vietnam. Why would he do this for three tours? Did he have some kind of death wish? Once again, I turn to General Horner’s forward which said, and I am paraphrasing a bit here; “You could conclude that he was either courageous or stupid to a fault, but you would be wrong on both counts. He loves the challenge of flying and the sting of battle. He is simply a warrior.” Well said! In the very beginning of the book, Riedel states his intent to tell his life’s story starting with his early memories to his current days as a man content with his life, with diverse interests to share with his wife. This is a scenario that sets up the possibility of a long boring read. Be he manages to avoid that trap, thanks to a crisp, no nonsense style of writing and a generous inclusion of photos. There is one thing about “Memories of a Fighter Pilot” that is different than other books of this genre I have read; and that’s what I like the most about it. Specifically, Riedel had the courage to discuss an aspect of family life in the military that few are willing to talk about publicly, even to this day. The truth of the matter is, that being married to a military man or woman is difficult at best; but being left alone for long periods of time managing the household, while in many cases being both mother and father to children creates enormous pressures on families. When I was in the Air Force, we used to say that extensive absences from home or living in a substandard environment made good marriages stronger and caused bad marriages to get worse. Unfortunately, the latter happened to Riedel more than once; and I admire him for including that part of his life in his story. 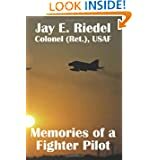 In summary, it goes without saying that “Memories of a Fighter Pilot,” by Jay Riedel is a well written and very readable book. But more importantly, his story provides a powerful reminder of the sacrifices made by military families past and present in service of our country. For that reason alone it is a must read book.